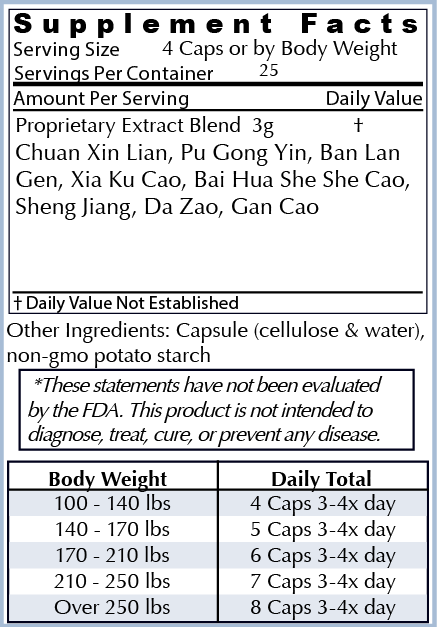 This formula contains several antiviral and antibacterial herbs including Chuan Xin Lian Andrographis, which has been shown in double blind studies to prevent the onset of colds in healthy people. **Take at first signs of a cold or flu, START AS EARLY AS POSSIBLE. *Our favorite cold & flu preventer is Cold & Flu KILLER. Cold & Flu Releaser can be used with Killer as an extra boost. Pathogens like bacteria and viruses enter the body through the skin & mucous membranes. Before a pathogen fully penetrates the protective qi screen of the body it can be resisted in two ways. The antiviral/antibacterial herbs in the formula The “Cold & Flu Killer” are very effective when taken early -at FIRST SIGNS of cold or flu - gland swelling, dry scratchy sore throat, feeling a bit off like a cold is coming. 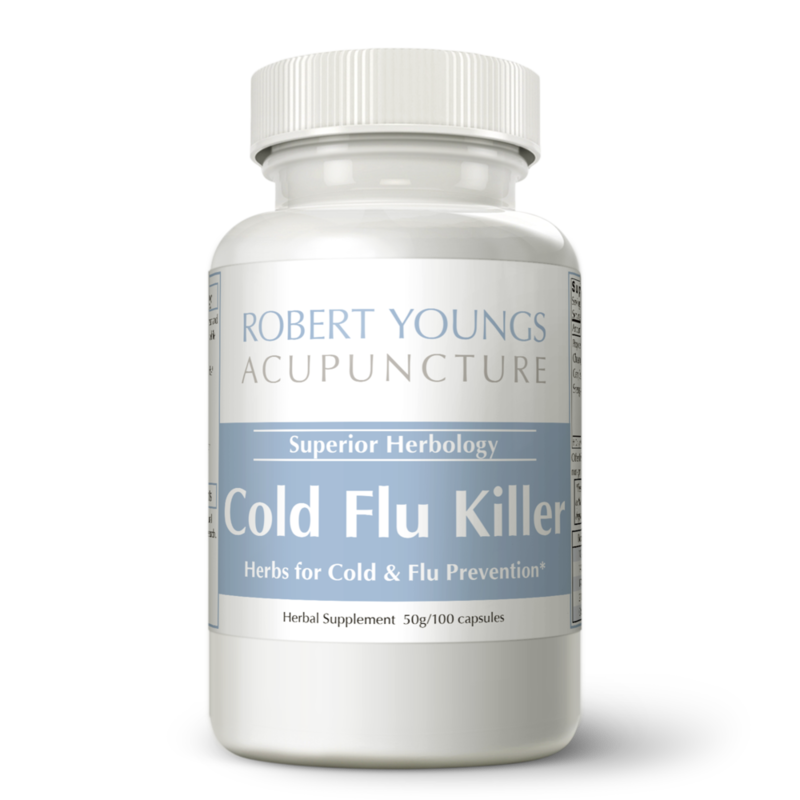 Cold & Flu Killer contains antiviral and antibacterial herbs including Chuan Xin Lian Andrographis, which has been shown in double blind studies in China to prevent the onset of colds in healthy people. The “Cold & Flu Releaser” uses natural Traditional Chinese herbs to induce a slight sweat and release the pathogen from the body surfaces while also removing damp and phlegm from the interior. It is a great support to use in tandem with Cold & Flu Killer. Taken together, The “Cold & Flu Killer”. and the “Cold & Flu Releaser” are very effective at preventing the development of a cold or flu but if you have to choose one, start with Cold & Flu Killer. Take at first signs of a cold or flu. -Know your personal symptoms, scratchy throat, tenderness & swelling in glands below ears. If you feel any of these or your signs, start taking these two formulas Immediately! Continue to take for another 24 hours AFTER you feel better! If you feel any of these or your signs, start taking Immediately! Stop taking any building or tonifying herbs while fighting a cold or flu. Chuan Xin Lian (Herba Andrographis) is commonly used in traditional Chinese medicine for its heat-clearing, detoxifying and curative effects. Chuan Xin Lian has a mild inhibitory effect In vitro against Diplococcus Pneumoniae and I)- hemolytic streptococcus and is quite effective in treating infections in vivo. It has been proposed by many that its effectiveness in treating infections is due in part to its immune-enhancing effect. Bitter and cold, Chuan Xin Lian covers four different channels – Lung, Stomach, Large Intestine and Small Intestine. It is commonly used to treat wind-cold symptoms, such as fever, sore throat, cough and headaches. Due to its detoxifying and heat-clearing properties, Chuan Xin Lian can also be used to treat snake bites, eczema, sores and carbuncles that include toxic heat. Pu Gong Yin (Herba Taraxaci), also known as dandelion, isn’t only a fun plant, but one with amazing medicinal properties as well. Used since ancient times in traditional Chinese medicine to clear heat and toxins from both the exterior and interior of the body. Rich in minerals and containing more vitamin A than carrots, this bitter and sweet plant can be used to treat lung abscess, fever, cough, sore throat and urinary tract infections. Since its main functions include clearing heat and removing fire toxicity, Pu Gong Yin can also relieve nodules, breast lumps, intestinal abscesses and is excellent in treating the early stages of breast cancer. Research: According to one report, 45 patients with acute sore throat were treated with 98% rate of effectiveness with a formula containing Pu Gong Yin. Often used in both Chinese and Western medicine, Ban Lan Gen (Radix Isatidis) is probably one of the most popular medicinal herbs. Bitter and cold, Ban Lan Gen enters the Heart and Stomach meridians, clearing heat and toxins from the Qi (energy) and Xue (blood) levels. It is commonly used to treat symptoms like fever, sore throat, tonsillitis, flushed and swollen face and feverish sensations. Although its main functions are to cool the blood and relieve sore throat, Ban Lan Gen can also be used to treat hepatitis, chickenpox and encephalitis. Xia Ku Cao (Spica Prunellae) is a well-known plant in traditional Chinese medicine, primarily for its heat-clearing properties. Bitter and cold, it is commonly used to clear heat and sedate fire from the Liver and Gallbladder. According to Chinese medicine, Liver fire flaring upwards can lead to swelling, pain and redness in the eyes, excessive tearing, as well as headaches and dizziness. Soothing this channel, Xia Ku Cao can improve eyesight, eliminating stagnation and swelling. Xia Ku Cao is also used to clear hot phlegm. When heat is stagnated in the body for a long period of time, body fluids dry, forming phlegm masses or nodules. Due to its cooling properties, Xia Ku Cao clears the heat from the body and softens the phlegm. Slightly bitter, slightly sweet and cold, Bai Hua She She Cao (Herba Oldenlandia) clears heat and toxins, eliminating stagnation and dampness. It is commonly used to treat sore throat, cough and wheezing due to lung heat, and is an important part of the cold and flu killer formula. A well-known cancer fighting plant, Bai Hua She She Cao has gained some popularity among Western medicine as well, due to its amazing healing properties. Combined with other heat-clearing and toxins-eliminating herbs, it can prevent tumor growth and treat various types of cancer. Sheng Jiang (Rhizoma Zingiberis Recens), also known as fresh ginger root, has been used in Asian cooking recipes since ancient times. Valued for its health properties, Shen Jiang is also used in Chinese medicine to treat and prevent colds, enteritis and stomach problems. Slightly warm, Shen Jiang can induce perspiration and is commonly used to treat the early stages of wind-cold syndrome. This acrid herb can warm the Lung, dispelling cold and stopping coughing. Shen Jiang can also stimulate the gastrointestinal mucosa, relieving nausea and vomiting. It is often used to enhance digestion and to treat numerous stomach related problems, such as bloating, abdominal pain, vomiting or diarrhea. Da Zao (Fructus Jujubae), also known as Jujube fruit, has been used in Chinese medicine for more than 4.000 years. Sweet and warm, and rich in vitamin C, it is mainly used to strengthen the middle-Jiao and to nourish the blood. Clinically, Da Zao treats disorders such as shortness of breath, fatigue, loose stool, decreased food intake and diarrhea. Da Zao has a harmonizing effect, soothening the toxic effects of other herbs, being a great component of the cold and flu killer formula. Versatile and packed with health benefits, this sweet plant is indispensable to many herbal formulas. Balancing the Yin elements of the body, it can invigorate the Spleen and the Stomach, improving the transformation and transportation functions of these channels. Gan Cao also moistens the Lung, nourishing the Qi, dispelling phlegm and stopping cough. Neutral in properties, but incredibly effective, it is a great addition to the cold and flu releaser.